Simone Solinas has a conference in POLITECNICO MILANO:"Residenze sociali e edifici pubblici in Spagna"
The activities in the edition of 2012 will have as a central concern the definition of a strategy for rehabilitation, enhancement, facilitation and improvement of the usability of the most significant archaeological sites in the network of municipalities of Monte Arci, through a study of micro-architectures can connote the recognition of these places in a project coordinated and shared. The School of Architecture at the University of Cagliari is expanding its course offerings with the establishment of a Summer School/Design Workshop. The summer school seeks to respond to the widespread demand for the transformation of specific contexts through design and research that involve young designers, recent graduates and students interested in discussions – both theoretical and practical – of the main issues raised by the architectural and landscape design of places. International Summer School is opened to students coming from six important Schools of Architecture: School of Architecture of Cagliari; Academy of Architecture of Mendrisio; ETH Eidgenössische Technische Hochschule, Zürich; TU Technische Universität, Wien; School of Architecture University of Waterloo, Cambridge; Ecole Nationale Supérieure d’Architecture de Marseille. Each School will select theirs students with a specific announcement. 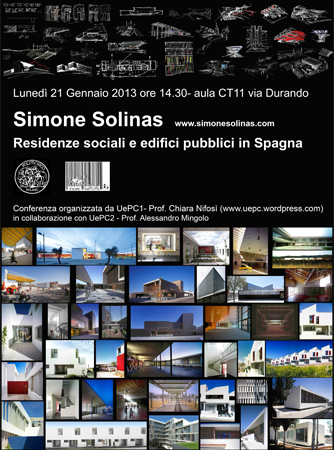 Simone Solinas is Visiting Professor at the Univerity of Cagliari, School of Architecture. Sardinia, Italy"
The Italia Pavilion at the"13. Mostra Internazionale di Architettura della Biennale di Venezia", assigned to the trustee Luca Zevi by the General Direction for landscape, fine arts, architecture and contemporary art of the Ministry of Heritage and Culture, is titled LE QUATTRO STAGIONI Architectures Made in Italy by Adriano Olivetti in the Green Economy. The event Giovani architetti italiani/Incontro sull'architettura contemporanea is designed by architects Annabella Bucci - Coordinamento Consulta Giovani dell'Ordine Architetti di Roma- and Valeria Marsaglia - Presidente MAGA (Milano Associazione Giovani Architetti). The event will take place on 10/06/2012 at the Italia Pavilion - Space meetings where studies will be required to submit their projects through a video prepared for the occasion and a special technical consultation with the dual role of consultation coordinated by the critics' architect Franco Porto (Coordinatore Segreteria Nazionale IN/ARCH) will spark a real talk. Parallel to the convention planners will be subjected to a video interview at the Italian Pavilion by the architect Luca Gibello - Editor in Chief of "Il Giornale dell'Architettura". with the project "46 VPO en Mairena del Aljarafe"
Simone Solinas (ssa | solinas serra architects) wins the international competition for a sailing center in the ex prison of Trabuccato on Asinara's island, Sardegna. The University of Cagliari (UNICA) has supported international education through its InternationalVisiting Professor Program since 2006. The project will be a unique opportunity to reuse and requalificate one of the unused building of the existing ancient prizon as an international sailing school in the extraordinary context of the National Park of Asinara. Collaborators 1st end 2nd fase: Architects; Walter Cuccuru, Alina Desole, Alberto Gadaleta, Eleonora Gigantesco, Fabio Giordano, Bianca Maria Giorno ,Simone Langiu, Agostino Sotgiu. Consultants: Luca Taras, Stefania Pisanu, Roberto Ligas.